Many churches just celebrated Epiphany. In the church calendar, Epiphany fills one official role and one unofficial role. Officially, it’s the time that we celebrate either the arrival of the Magi or the baptism of Christ. Unofficially, it’s the time we begin to joke about broken New Year’s resolutions. Actually, that’s too generous. Many of us started joking about broken resolutions almost a week ago. For some reason, we have the idea in our cultural consciousness that we break most of our New Year’s Resolutions within a few days—if not hours. But it’s not true. 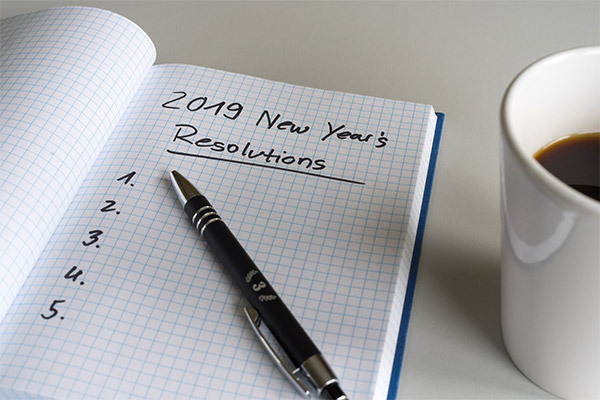 When it comes to our New Year’s Resolutions, we don’t give ourselves enough credit. Consider the most popular resolutions. You might guess that they tend to be things like “get in shape” or “get healthier” or “exercise more.” In whatever form, many resolutions end up meaning “lose weight.” The American Psychological Association published an article a number of years ago confirming this suspicion. The top three resolutions they found were “lose weight,” “exercise more,” and “quit smoking.” At the time the article in the APA was published (2004), those three resolutions made up roughly three quarters of the total reported resolutions. Luckily, these two issues—smoking and weight—are thoroughly researched. With some help from the Center for Disease Control and Prevention (www.cdc.gov) and a medical journal or two, we can find out how well we kept our resolutions. So, over the last decade and a half, how have we done? Let’s look at the smoking resolution first. Since the APA article listed above was in 2004, we can start there. In 2004, the CDC reported that roughly 20.9 percent of adults in the United States smoked cigarettes. That’s roughly 44.5 million people. Since non-smokers don’t usually resolve to quit smoking, one can only assume that the people resolving to quit are in that 44 million. Did they keep their resolutions? According to the CDC’s most recent data, in 2016 roughly 15.5 percent of adults in the United States smoked cigarettes. That’s 37.8 million people. That means that over twelve years, the smokers in the U.S. dropped from 20.9 percent to 15.5 percent. In raw numbers, there are about seven million fewer smokers. That’s a drop of about half a million smokers each year. While there are many reasons for the decline, it seems that at least some of those who resolved to quit smoking actually did! But the weight thing—that’s tougher. Over the same time period (2004 to 2016) the United States has seen a marked increase in the number of people with extreme weight problems. The change indicates that we need to do a better job controlling our weight as a country. Yet, the final word about weight loss resolutions may be more encouraging. A study published in the New England Journal of Medicine examined holiday weight gain in Germany, Japan, and the United States. 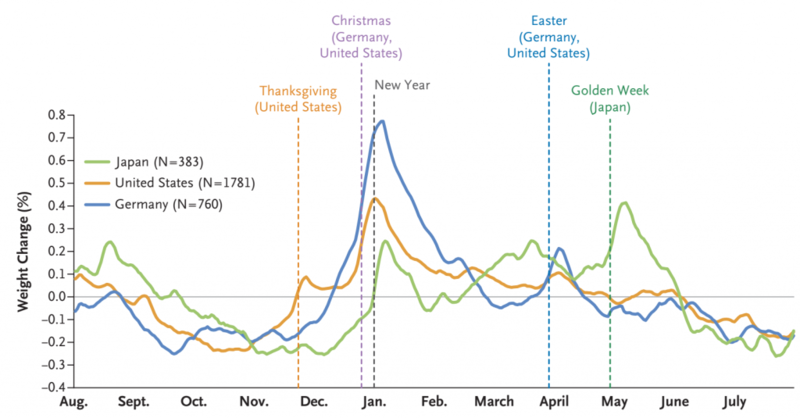 The results indicated that in the United States, weight tends to peak about 10 days after Christmas, around Jan. 4. By Jan. 6 or 7, however, our weight starts to drop. About the time we start joking that our resolutions are broken, they’re just starting to work! “Weight Gain over the Holidays in Three Countries”. 2016. New England Journal of Medicine. 375 (12): 1200-1201. Typically half of the weight gained in December drops away pretty quickly, evidence that the “lose weight” resolution may be taking hold. Often the rest of the weight is gone within a few months, despite a setback around Easter. Our scales typically show the lowest numbers in late summer or fall. In other words, we put on weight in December, pledge to lose it in early January, and then spend the next several months successfully doing exactly that. So what does this mean for our resolutions? It means that we do a pretty good job keeping them. We resolve to stop smoking, and many of us do. We resolve to lose the holiday weight, and many of us do. These victories may not be caused by the resolutions but perhaps the resolutions help. Of course we eat less after Christmas is over, but combined with intentional effort, the weight may come off a little easier. Sure, some of us won’t quite make it. Many people want to lose not just the holiday pounds but a few more. Plenty of people are still trying to say goodbye to nicotine. But on the whole, maybe we do a better job at our resolutions than we realize. It means that we have reason to be a bit more optimistic about ourselves and our ability to reach our goals. It also means that our resolutions are bigger than the first few weeks of the year. When we experience setbacks, it may be helpful to remember that keeping our resolutions, whatever they are, can be a longer term goal than January. As this new year continues, we will be tempted to give up on or even make jokes about our resolutions. When you hit that temptation, try to slow down and remember that our resolutions are far more successful than we sometimes realize and offer some grace to yourself and others as you try to keep up the good work! The Rev. Derek Davenport ’05 is director of the Seminary’s Miller Summer Youth Institute and digital marketing analyst. Derek is also a PTS alumnus of the Master of Divinity (MDiv) Program and Master of Sacred Theology (ThM), between which he served at a church in Orlando, Fla., for five years. Besides working with youth pastors and young adults, he serves as a guest preacher in Western Pennsylvania, researches church symbolism on his website, and tweets at @DerekRDavenport.